As part of her interdisciplinary artist collaboration with Deaf and hard of hearing youth, Dawn Matheson has created an interpretation of E.E. 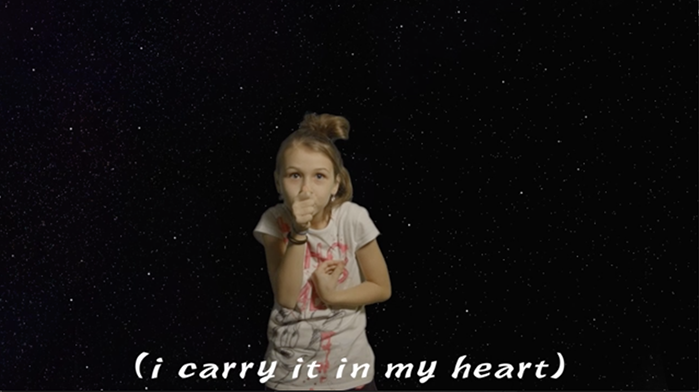 Cummings’ poem [i carry your heart with me (i carry it in], performed by 9-year-old Guelph resident, Nora Stasinkiewicz. The video will be be projected on the top of the Kitchener City Hall as well as running as a trailer at the Princess and at the Apollo movie theatres during CAFKA.18. E. E. Cummings experimented with the form and function of language to create his own personal style and voice, often by inventing new words by combining two together into a new synthesis. He also viewed the poem as a visual object on a page. Dawn Matheson is drawn to the ownership of personal expression. She suggested this poem to Nora to interpret through her own language of ASL. She embraced it and made it her own. Norsa hopes to become an actor one day. Dawn Matheson is an interdisciplinary artist and writer working in video, radio, art installation, community collaboration, performance and print. As part of the Guelph Film Festival, the artist, along with filmmaker Erin MacIndoe Sproule, presented five films featuring stories of immigrant Canadians and their objects of meaning on display at the Guelph Museum. Transported: Objects of Meaning and the Immigrant Experience ran at the Guelph Museum, from November 2017 through this past February. A major ongoing project of the artist is A Sense of Wonder, a two-year project collaborating with Deaf kids and kids with hearing loss at the Art Gallery of Guelph. The first year of the exhibit featured a video at the Art Gallery of Guelph in 2017, which was screened for the Toronto International Deaf Film and Arts Festival at HOT DOCS cinema in May, and featured at Summerworks Performance Art Festival in August.